The Biophilic Mind: Who Deals Best with Stress - City Dwellers or Farmers? Have you ever been on a farm? I have. I grew up visiting my grandparents’ dairy farm in rural Ohio, so the sights and smells of farm life are familiar to me. Being on the farm always made me feel closer to the earth, and now that I am a city-dweller I find that thinking of nature often conjures up images of red barns and spotted cows. My free associations aside, there is new evidence that growing up in a rural setting surrounded by farm animals may be linked to health benefits! The authors of this 2018 study from the Proceedings of the National Academy of Sciences explain that, while a little inflammation is an ordinary immune response (like healing a wound, for example), an impaired immune system may send out too much inflammation, and it can be difficult for your body to recover. 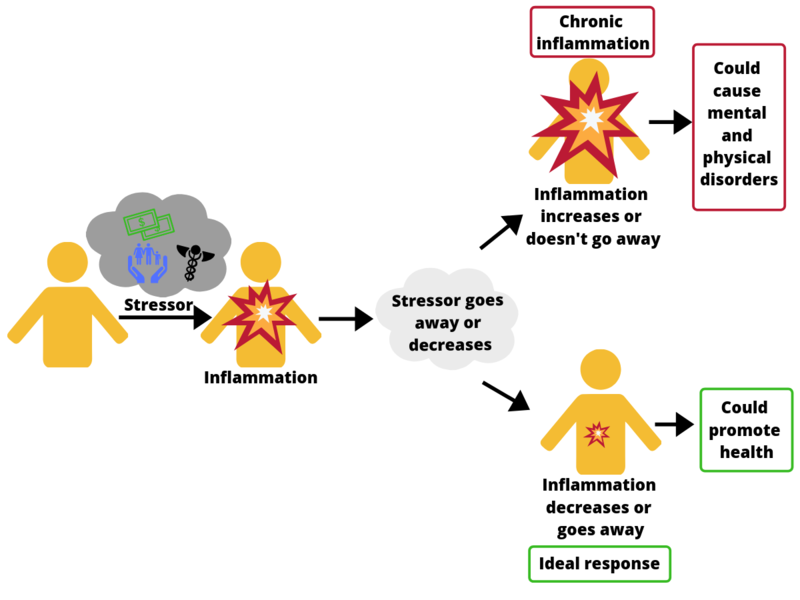 These over-reactive inflammatory responses are thought to underlie many diseases, from asthma and allergies to some stress-related mental disorders. The authors used a sample of 40 German men to examine how their childhood environment — growing up in a rural area with farm animals or growing up in an urban area with no pets — impacted their immune response to social stress. How did they induce social stress in the lab? They used something called the Trier Social Stress Test, which involves public speaking in front of a panel of stony-faced judges. Watch an example here. This public speaking test is a widely-used way of inducing stress, and for good reason! 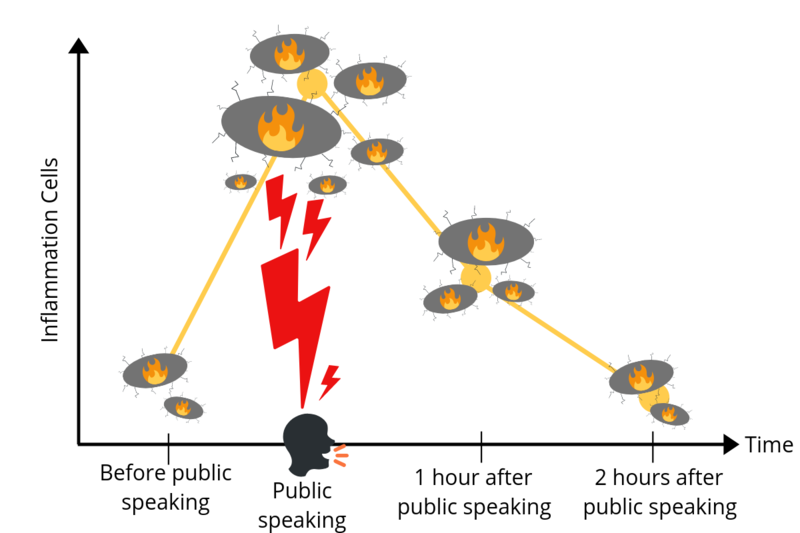 Most people experience a spike in stress hormones and inflammatory cells in the blood during and following the public speaking test. What did the researchers find? As you can see in the graph below, both groups of men started with the same stress levels (inflammation cells on the vertical axis) before the public speaking test. However, urban men had a bigger spike in than rural men. Even two hours after public speaking, the urban group showed higher stress levels than the rural group! So why should growing up in a rural setting with farm animals have anything to do with your immune response to social stress? The authors speculate that those who grew up in a rural place were exposed to a greater variety of microorganisms from farm animals, which reduced the severity of the reaction they had to stress in the future. Even though this study is exciting, there are a couple of limitations that we should take seriously. First, there could be another reason why the rural group did better than the urban group that has nothing to do with animal exposure. It is possible that some unknown third variable related to the place’s rural or urban quality actually caused the differences we see in immune reactiveness. Perhaps people in rural areas tend to have more siblings than those in urban areas, and it is actually contact with siblings (e.g., rough-housing or sharing germs) that makes them more resilient, and not necessarily that they were raised on a farm. To be fair, the authors report that they did not find differences between the groups on a wide variety of demographic variables. The other limitation lies in the fact that the participants were healthy, young, white men from Germany. Science and medical research have a history of ignoring or under-sampling women and people of color, which can lead to results not generalizing to different populations. That’s why you should look out for studies that use representative samples of participants! But I try not to get too wrapped up in the shortcomings — this study was done well and it tells us a little bit more about how access to biodiverse environments can impact our health!